A new partisan conflict index is at record highs--but its methods and conclusions are dubious. Did you know you can search major newspapers' archives going back more than a century? It's true. Many outlets[i] have digitized their print editions, providing ample fodder for enterprising researchers and curiosity-seekers alike. But one financial application grabbing headlines recently isn't as useful as it might seem. Some clever fellows looked for (and found) patterns they claim measure "partisan conflict" or "policy uncertainty." 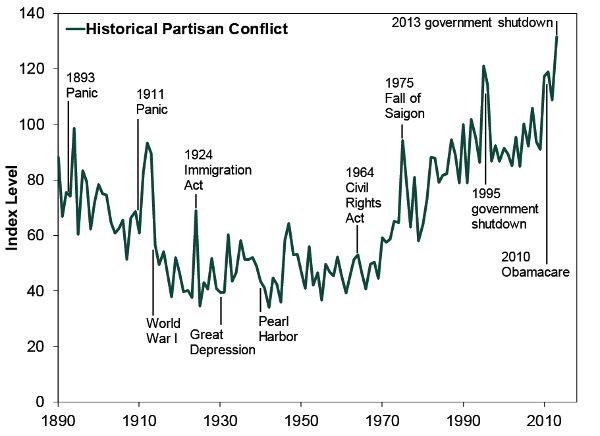 And lo, the Partisan Conflict Index (PCI) is near record highs -- since 1890! -- while the U.S.'s Economic Policy Uncertainty Index[ii] (EPUI) is coming off elevated levels but remains above its historical average (since 1985). The conclusion many draw: Presently high partisan conflict and policy uncertainty levels mean the ongoing bull market is sleepwalking its way to trouble. But there are a slew of flaws with these gauges and that interpretation. In our view, markets don't face the threat proponents presume. While we don't disagree partisan conflict is high now, it is worth wondering whether it is really a "record high." It's natural to think current events are more important and conflictier than the past -- recency bias at work -- but it's also historically myopic. Is partisan conflict really higher than during the Civil Rights era (when the PCI was near its lows)? The 1960s Civil Rights debate was jam-packed with angst, including 1968's tumult and riots. While it wasn't purely partisan, it doesn't get much more conflicty ... outside war. Source: marina-azzimonti.com, as of 8/1/2017. Historical Partisan Conflict Index, 1890 - 2013. That's all within living memory for many. Let's go the other way. The Panic of 1893 gets overshadowed by the Great Depression, but 18.4% unemployment rates aren't anything to sneeze at. Populists -- literally -- threatened to bring down their capitalist oppressors. This culminated in 1896's heated realigning election (the capitalists held sway). What of the bimetallic movement? The Red Scares (1 & 2), including the McCarthy hearings? The point here isn't so much that today is more or less conflicted than then, but rather, a reasonable person should have questions about how this is measured and tallied. Therein lies the rub. The index's problem is it doesn't measure partisan conflict so much as the media's coverage of it -- and badly at that. Actual conflict and coverage of said conflict aren't the same thing. Index movements could just as well reflect the ebb and flow of yellow journalism. The PCI doesn't and cannot disentangle the two. That's because all it does is count keywords in newspapers. Words like "divided," "congress" and "partisan." This isn't measuring partisan conflict. It's what newspapers say about politics, and they aren't impartial bystanders. Selling advertising gives an incentive to drum up controversy. This is particularly true lately, considering the cutthroat competition for eyeballs in media. And media outfits are finding Trump is good for ratings. As a CNN supervising producer said in a recent hidden camera interview, "Trump is good for business right now." CNN's ratings are through the roof. Newspapers of record are enjoying a renaissance with Wall Street Journal and New York Times circulation benefiting from a "Trump bump." But beyond bias, it isn't clear how researchers accounted for syndication. With fewer and fewer papers generating unique content these days, this is a major issue skewing the entire dataset -- and it could quite possibly generate false highs today. The EPUI uses the same methodology, with different keywords. [iii] Media reporting on these indexes of media mentions is an echo chamber: They are reporting on their own reporting. A lot of this talk stems from the mistaken notion gridlock -- and the attendant rhetoric -- is bad. PCI and EPUI presume government getting along to go along is inherently good. But that's a fallacy. It says very little about actual policies' economic disruptiveness -- what matters most for markets. Conflict or no, policy uncertainty occurs when the government DOES stuff: upending property rights; creating winners and losers; requiring businesses to adapt; driving unintended consequences, etc. And, heck, if politicians held hands, sang "Kumbaya" and enacted the equivalent of the Smoot-Hawley Tariff Act of 1930, that would be bad. Ditto for SarbOx Part Deux. Cooperation on legislation doesn't mean good legislation necessarily results. So in a sense, to whatever extent conflict is high, it seems to us like a symptom of bullish gridlock blocking radical legislation. That's why these gauges have been high throughout this bull. The media -- and these indexes -- just aren't interpreting gridlock correctly. Source: Economic Policy Uncertainty, as of 8/1/2017. Economic Policy Uncertainty Index, January 1985 - July 2017. Heading into 2017, folks mostly hoped for or feared legislation galore from the GOP taking the House, Senate and presidency. But given internal party divisions and now evident intraparty gridlock, government has accomplished much less than expected -- an underappreciated bullish factor for global stocks. 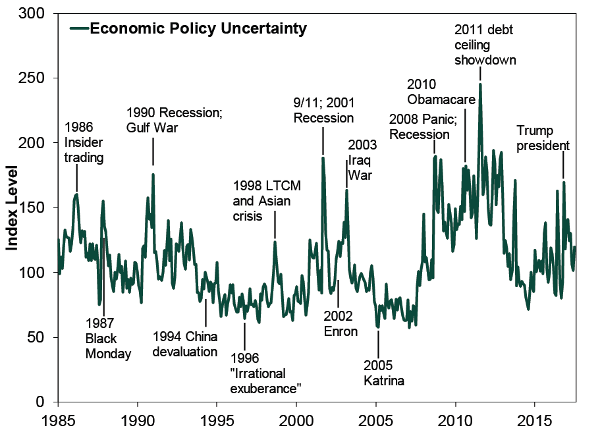 Political conflict, partisan or otherwise, likely lowered policy uncertainty. Something the PCI and EPUI completely missed in their misguided effort to quantify the unquantifiable. In our view, markets yawning while such gauges claim uncertainty is high shows stocks care about likely outcomes, not word count. [i] Like the New York Times. [ii] There are 21 of them for different countries, including "Global." [iii] Such as "economic" and "uncertainty" in combination with other keywords like "White House" or "Federal Reserve." It also tacks on the number of federal tax code provisions set to expire and disagreements among economic forecasters. The former might be useful, but not without context and analysis. Fisher Investments is an independent, fee-only investment adviser serving investors globally. To learn more about Fisher Investments, please visit www.fisherinvestments.com. The content contained in this article represents only the opinions and viewpoints of the author. It should not be regarded as personalized financial advice and no assurances are made the firm will continue to hold these views, which may change at any time based on new information, analysis or reconsideration. Investments in securities involve the risk of loss. Past performance is no guarantee of future results.